or it's location in the Caribean region - the island is less than 30 miles from Dutch St Maarten. 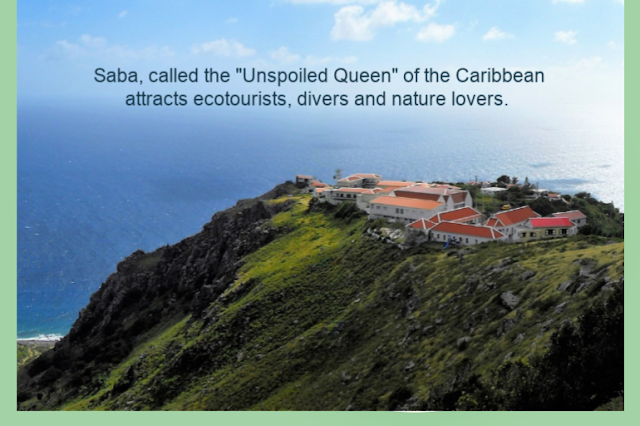 Saba is not on most tourists radar when planning a vacation to the Caribbean. If you're seeking miles of pristine beaches along the coastline, glitzy nightlife, casinos, or mega resorts this MAY NOT be your ideal destination. 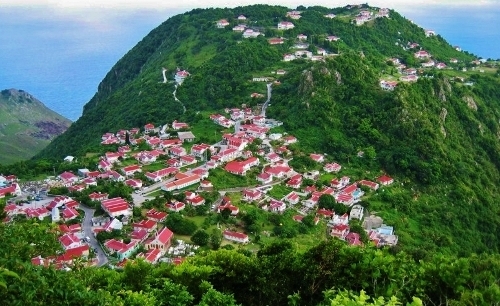 Saba is best described as a giant green mountain in a halo of white clouds, and the land rises sharply from the surrounding sky blue sea. This is a premier eco-tourism destination, with plenty of hiking trails, and over 25 excellent diving sites. I dearly love the small villages with gingerbread houses literally clinging to the mountain, hiking through the rainforest, the stunning views, friendly locals, and experience the unspoiled natural beauty. I'm an admitted beach bum and have visited the island three times. This is actually one of my favorite side trips when visiting other nearby islands. It's the perfect place to unwind for 3-4 days, and continue on to a beach destination. It's not difficult getting around the island. The only road on the island is aptly named "The Road " which consists of ten miles of concrete secured to the mountainside with stone walls. 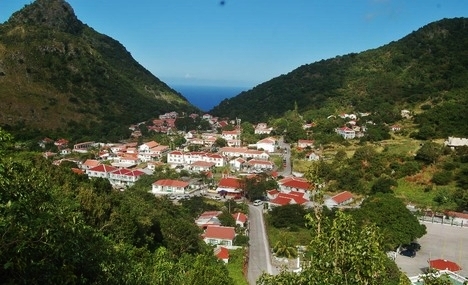 Saba is one of the cleanest places in the world. You will not find any litter, and everything seems to be in its place. There are four mountainside villages built into the mountain - the topography of the island is vertical and rises to a height of 2,855 feet. The island is surrounded by coconut, banana and mango trees, and you often imagine that you are in a true gingerbread fairyland. As you interact with the locals, you find they are well read, and many have traveled extensively. The locals love to talk about the island's history, along with world history, current events, nature, and fishing. They are very gracious to visitors, but also like that their island is basically unknown in the Caribbean chain. Lower tourism numbers keep the island in pristine shape. The island men are hard-working farmers and fisherman, who take great pride in their island, and the preservation of its nature. The island women are known worldwide for their intricate patterns called Saba Lace. Back in the 1800's the woman decided to promote their lace making business to the U.S. and other capitals around the world. They came up with the novel idea of writing down the addresses of companies from the shipping labels off of packages and shipments sent to the island. They continually wrote each and every company about their island lace product (including samples), and the lace business eventually became a viable global enterprise. 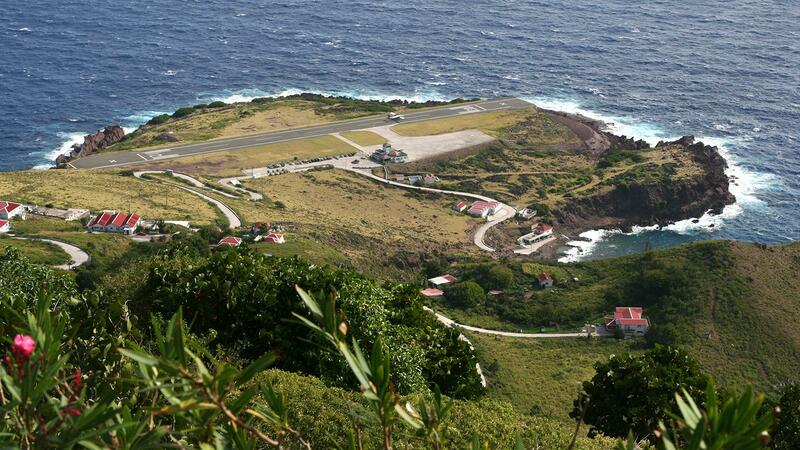 Saba has the shortest commercial runway in the world! Honestly the decent is a hair-raising experience. The airport is flanked on both sides by huge hills, and the length of the runway has ragged cliffs on both sides. Stepping off the plane you realize the expertise of the pilot's ability to land on a tiny cliff runway in the midst of this green mountain. Another less hair-raising alternative is flying into St Maarten, and taking the ferry ride to the island. I stated the island does not have any beaches, but that's not entirely true . . . There is a "seasonal beach" that appears once a year for a brief period in the late spring. It's called the Disappearing Beach, and there other spots around the island with tide pools, but as stated above this is not a beach destination. If you're into hiking, a climb up the stone steps to Mount Scenery is a must - the highest point of the island reaches into the clouds. Signs along the pathway describe the tropical vegetation - elephant ears, orchids, begonias, exotic palms, and other tropical plants. Reaching the summit was no easy feat, however, the view in the clouds was absolutely worth the effort. If you're into eco-travel, or in need of a vacation spot to unwind, definitely put Saba on your bucket list - and if you plan your vacation during March/April, you'll have the opportunity to see the Humpback Whale migration.